Visiting County Kerry? This part of the Irish Province of Munster has a number of attractions you will not want to miss. Plus some interesting sights that are slightly off the beaten path. 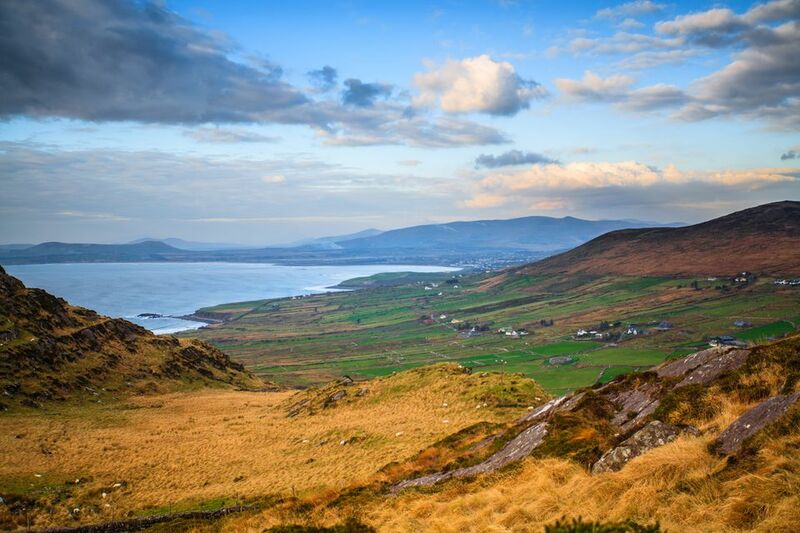 So why not take your time and spend a day or two in Kerry when visiting Ireland? Here are some ideas to make it worth your while and some background information to help you along. The Irish name for County Kerry is Contae Chiarraí, which translates literally as "The Children of Ciar" (denoting the area these children, this tribe, claimed as their birthright), it is part of the Province of Munster. The Irish car registration letters are KY and the county town is Tralee. Other important towns are Ballybunion, Cahersiveen, Castleisland, Dingle, Kenmare, Killarney, Killorglin, and Listowel. Kerry has a size of 4,807 Kilometres square, inhabited by a population of 145,502 according to the 2011 census. Yes, everyone does it and in the summer season, it can be bumper to bumper in places, with no places to park and barely a place in a café and restaurant but the Ring of Kerry still is one of the great scenic drives Ireland provides. Rugged, windswept, best experienced in mixed weather, with billowing clouds rolling in from the Atlantic. If you are pressed for time, you can drive "the Ring" in a few hours, allow a day for more leisurely sightseeing. Bring sandwiches and a flask of tea if you are on a budget. The town of Killarney is the original tourist resort, popular for ages and famed through Queen Victoria though the once remote town has suffered a bit over time, with a strip of hotels growing on the outskirts and a totally tourist-driven downtown area. Expect dueling banjos, fiddles and tin whistles on warm evenings. But the scenic beauty of the lakes and the Killarney National Park (to be explored on foot, in a boat or by hiring a local jarvey and his horse-cart) are still there and generally free to enjoy. Take your time, avoid the worst crowds; outside the summer season and school holidays, Killarney is better. Best experienced either from the coastal viewpoints, through the Skellig Experience on Valentia Island or by taking a boat and climbing, the latter only recommended for those fleet of foot, fit of heart and free from vertigo. It's a monastery settlement established by monks who wanted to turn their back on the world. Beehive huts and steep steps may be the only remnants but Mother Nature more than makes up for this minimalistic man-made attraction. Kerry is a delight for hill-walkers and mountaineers (and a hotbed of mountain rescue activities) - many peaks are worth the ascent. From stunning Mount Brandon on the Dingle peninsula, towering over the Atlantic at 953 metres height, to the big daddy of them all: Carrantuohill, just west of the Killarney lakes and, at 1041 metres, Ireland's highest mountain. What may surprise some people is the accessibility of this peak, which can be reached even by those with moderate experience. Just don't attempt it in bad weather and consider getting down before it gets dark. In Killorglin, the billy goat is king, at least for a few days in summer, when a horned one is crowned and Puck's Fair is held. Though it's becoming more and more commercialized, this is one of Ireland's oldest fairs and still retains some really old traditions. The crowned goat hints at pagan origins, though these are well and truly lost in the mists of time. Part of the Slea Head Drive around the Dingle peninsula, this early Christian church near Ballyferriter was built more than a thousand years ago, very simple in terms of construction, but it still stands strong and it's still totally waterproof (which cannot be said for may of the holiday homes that sprouted in the vicinity). Impressive for what it is, not for any grandeur or show effect. Here, beauty indeed lies in the eye of the beholder. The Blasket Islands, west off the Dingle peninsula, have been evacuated decades ago when life there was deemed too tough by the government; the deserted villages still remain and odd (in many senses) inhabitants come over for summer. But the Blaskets left a literary legacy - from folklore icon Peig Sayers (who was not a native) to many novels and poems. All this is explored in the excellent Blasket Centre at Dunquin. While Kerry may be about coast and cliffs for most people, getting deep into it might be worth a try. By visiting Crag Cave you can see Kerry from below. Located not far from Tralee, the cave has been developed for visitors after its discovery - which only happened officially in 1983. The limestone caves are said to be a million years old and sport some impressive stalactites and stalagmites. There even is a "Crystal Gallery", where all that glitters is definitely not gold. Once a year, Tralee muscles into the national consciousness of the Irish when the Rose of Tralee is crowned at the culmination of a festival that celebrates the Irish female in a very quaint and innocent way. Young women from all over Ireland and the "diaspora" congregate in Kerry's county town to battle it out for the title (and a small prize). Visiting County Kerry and stuck for something to do in the evening? You could do worse than head out into a local pub (which, be default, will be an "original Irish pub") and then join a traditional Irish session? Most sessions start at around 9:30 pm or whenever a few musicians have gathered. Call ahead because the days and times may recently have changed.